Following on from the leaked information yesterday which revealed Amazon’s new Kindle Voyage E-Reader device ahead of any official announcement by the company. Amazon later in the day officially launched their new flagship Kindle Voyage for $199, together with an updated Kindle device that is priced at $79. The new 7th generation Kindle in the form of the Kindle Voyage is Amazon’s most advanced e-reader and sports a new design, with a flush glass front combined with a magnesium back. 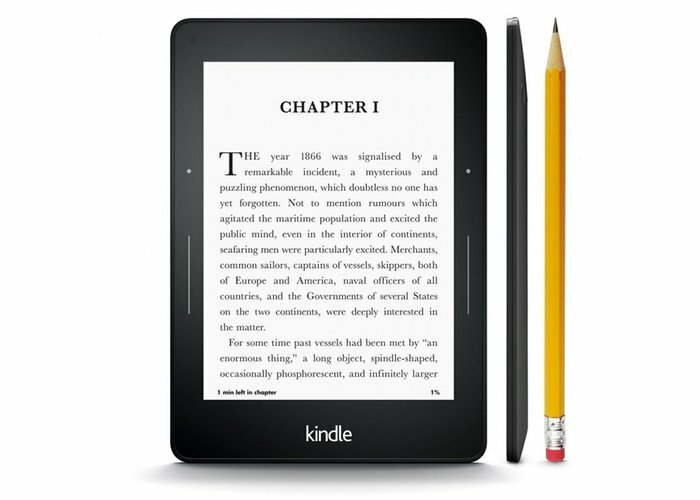 Providing the Kindle with a casing that measures 7.6mm thick and a device weighs less than 6.4 ounces. The New Kindle Voyage is fitted with a new Paperwhite display, offering users the highest resolution, highest contrast, and highest brightness of any Kindle. With 300 pixels per inch and specially strengthen, scratch proof glass. The other new Amazon E-Reader will replace the lowest priced Kindle device and is now equipped with a touchscreen display, a 20 percent faster processor and is priced at $79. Both new Amazon Kindle devices are now available to preorder and shipping will start sometime next month. For more information on the new Amazon Kindle Voyage jump over to the Amazon press release website for details.